The Marcellus and Utica-Point Pleasant currently dominate shale gas production in the Appalachian Basin. 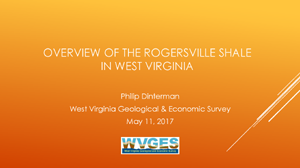 While the Middle Cambrian (~500 million years old) Rogersville Shale is not a current gas play, does the Rogersville have the potential to be a productive play in West Virginia? The Rogersville is an organic-rich dark shale mixed with siltstone and carbonates. It is relatively deep in West Virginia, approximately 10,000 to 17,000 feet below land surface, which is about 7,000 to 9,000 feet below the Marcellus and about 5,000 feet below the Utica-Point Pleasant. Deposition is limited to within the Rome Trough, an extensional graben (down-dropped block) part of an interior rift system (pulling apart) formed during the opening of the Iapetus Ocean. Several wells have been completed in Kentucky where the Rogersville is shallower (5,000 to 10,0000 feet deep). It ranges in thickness from 0 to over 1,000 feet, but is not organic rich throughout its entire thickness. The presentation discusses how the Rogersville differs from the Marcellus and Utica-Point Pleasant, why it has potential for development, and some of the reasons it has not been developed as a gas play yet. This poster accompanied core from the Sandhill Well, Power Oil Company's Well #9634 (API #4710700351) in the Trenton/Point Pleasant/Utica from Wood County, West Virginia during the core exhibit/workshop at the 2017 ESAAPG meeting. The section of core presented at the meeting was taken immediately above and below the Trenton/Point Pleasant contact. Drilled in 1955 near the crest of the Burning Springs anticline in Wood County, WV, by the Hope Natural Gas Company in conjunction with the South Penn, Manufacturers Light and Heat, and Columbian Carbon Gas companies, this core represents the first well in West Virginia to penetrate the entire Paleozoic section from the ''Coal Measures to the Precambrian.'' Nearly 2,870 feet of the well was cored, mostly from the basal Cambrian and Ordovician sections. The core samples were split amongst researchers from ten different institutions and initial results were presented in West Virginia Geological Survey Report of Investigations 18, A Symposium on the Sandhill Deep Well, Wood County, West Virginia (Woodward, 1959). In 2013, the Ordovician section of this core experienced renewed interest due to its location near the active Utica/Point Pleasant shale gas drilling fairway. Over the following four years, several researchers described and analyzed this portion of the core, including representatives from CoreLab and Chesapeake Energy. Results of these investigations are shown on this poster and include whole-rock pyrograms, source rock analyses, x-ray diffraction results, and vitrinite reflection reports. Remaining recoverable and original in-place resource estimates for the Marcellus and Utica plays with a glimpse at the Rogersville Shale and horizontal well activity. 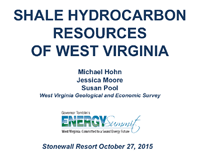 Presented at the 2015 West Virginia Energy Summit at Stonewall Resort, an annual meeting of energy experts sponsored by the West Virginia Governor's Office, the Department of Commerce, and the Southern States Energy Board. This talk was also presented to Reserves Estimation Unconventionals - REU Houston - in 2016. Three shale-gas units underlying northern and north-central West Virginia create opportunity for one horizontal well pad to produce from multiple zones. The Upper Ordovician Utica/Point Pleasant, Middle Devonian Marcellus, and Upper Devonian Burket/Geneseo Shales yield significant quantities of hydrocarbons in this area, and comparison of individual reservoir characteristics enables construction of fairway maps for each play. This poster accompanied the core from PPG Industries Brine Well #36 (API #4705100674) from the Salina F-4 Salt in Marshall County, West Virginia during the core exhibit/workshop at the 2017 ESAAPG meeting. It offers a rare glimpse of the Salina F-4 salt unit, a target of solution-mining activities since World War II. The core, drilled in 1980, was recently analyzed as part of a study of potential candidates for subsurface storage of natural gas liquids. Results of the Appalachian Storage Hub study, conducted by researchers from the state geological surveys of Ohio, Pennsylvania, and West Virginia, were released to the public on September 1, 2017 and are included on the WVGES web site here. The large-diameter core has not been slabbed and features many examples of fracturing and structural deformation. This poster includes a graphic log with descriptions, full elemental geochemistry, and a complete set of photographs for the core. West Virginia, known historically as a coal producing state, has recently experienced a dramatic increase in natural gas production from the Marcellus Shale. Since 2005, over 2100 Marcellus wells have been drilled in the state. 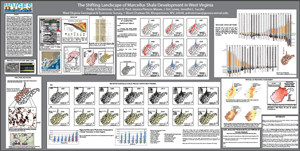 A number of vertical wells penetrated and produced from the Marcellus Shale before 2005, but use of the technical combination of horizontal drilling and hydraulic fracturing of wells created a rapid escalation of shale gas drilling in the Appalachian basin. Projections for future production continue to increase. 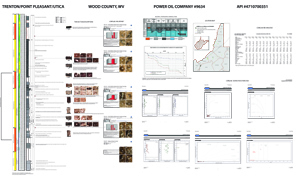 The West Virginia Geological and Economic Survey continuously updates a database for all oil and gas activity in West Virginia while conducting geological research. Current research includes the examination of the geological controls on the Marcellus Shale as well as a volumetric resource assessment of Marcellus potential in the State. 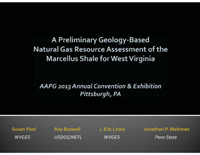 An overview of work detailed in 2013, Pool, Susan E., A Preliminary Natural Gas Resource Assessment of the Marcellus Shale for West Virginia using Basic Geologic Data and GIS, West Virginia Geological and Economic Survey, Open File Report OF 1305, 67 p., (PDF, ~4 MB), the study provides a conservative estimate of Marcellus Play original in-place resources for West Virginia. This presentation outlines study methodology and includes statewide maps for in-place volumes, volume of shale, total organic carbon, level of organic maturity, pressure, temperature, and thickness. This talk was also presented to the Appalachian Geological Society in the Fall of 2013. The Tuscarora Sandstone in the Indian Creek field in Kanawha County, West Virginia produces commercial volumes of food-grade carbon dioxide (CO2) as a constituent of the natural gas stream. Commercial production of naturally occurring CO2 in the Appalachian basin is unique to the Indian Creek field, providing a natural laboratory for the effects of potential carbon storage and a unique opportunity to examine an analog for long-term carbon storage. Because the mechanisms of this CO2 generation and trapping are not fully understood, researchers examined thin sections, well logs, drilling and completion reports, and core from wells inside the Indian Creek field and compared these data to wells from nearby fields that do not produce significant amounts of CO2 in gas accumulations. The resulting geologic cross-sections and isopach maps of the Tuscarora were augmented with Computed Tomography (CT) scans of the cores to assess potential fracture networks and migration pathways. Pores in thin sections of Tuscarora taken from a well drilled inside the field exhibit thin, incomplete, linings of calcite that appear to be an early cement partially dissolved by later pore fluids to produce CO2. A second possibility for CO2 generation is suggested by the presence of pores lined with framboidal pyrite typically associated with bacterial degradation of organic matter such as hydrocarbons. Thin sections from core reveal bedding-parallel stylolites, often filled with heavy minerals and/or clays, as well as thick quartz overgrowths, and sutured grain contacts. Sediments in this core are burrowed; the burrows are backfilled with very fine to silt-sized quartz. Porosity is fracture-enhanced and contained within burrows rather than the matrix. The Midwest Regional Carbon Sequestration Partnership (MRCSP) is a fourteen-year-old collaboration among ten states studying carbon capture, utilization, and storage, including carbon storage in deep saline aquifers and enhanced recovery of oil and natural gas via CO2 floods. 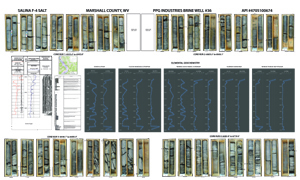 The West Virginia Geological and Economic Survey (WVGES) is working with other MRCSP partners to update the existing database of petroleum fields in the region and construct a set of regional geologic cross sections illustrating subsurface opportunities for CO2 enhanced oil recovery in depleted oil fields, enhanced gas recovery in organic-rich shales, and CO2 storage in deep saline aquifers. When combined with results from other areas of MRCSP research, these cross-sections enable policy makers, researchers, and other constituent groups to visualize and determine viable options for mitigating CO2 point sources. The West Virginia Geological and Economic Survey has a method to design "quick-look" maps illustrating state-specific opportunities for additional oil recovery in legacy oil fields via carbon dioxide enhanced oil recovery (CO2-EOR). These maps contain a variety of field-specific data, including CO2 storage capacity, residual oil in place, and oil gravity. This work is part of the comprehensive characterization of carbon capture utilization and storage for the Midwest Regional Carbon Sequestration Partnership. Oil production has been a part of West Virginia's economy since 1860. Cumulative statewide oil production rates peaked at 16 million barrels in 1900 and began a steady decline that led to eventual abandonment of many early fields. Of the remaining active fields, several continue to be economically viable today due to secondary recovery water floods and are the focus of examination for potential tertiary recovery via CO2 floods. As part of an effort led by the Midwestern Regional Carbon Sequestration Partnership (MRCSP) to identify potential carbon capture, utilization, and storage (CCUS) opportunities, the West Virginia Geological and Economic Survey is examining reservoir parameters in an attempt to establish a suitability ranking system for WV oil fields. Key characteristics were derived from existing sources and several fields were identified as potential targets for more detailed characterization. Many of West Virginia's coal-fired power plants are situated within 20 miles of EOR suitable fields and would be readily-available sources of CO2 if the cost of retrofitting the plants became economically viable. HOHN, Michael E., MCCREERY, Samantha, MOORE, Jessica Pierson, and DINTERMAN, Philip A. Regulatory agencies increasingly consider karst terrain when issuing environmental permits. The state Legislature tasked the West Virginia Geological and Economic Survey (WVGES) with developing a map showing areas of potential karst. Soluble rock units, including portions of the Greenbrier and Helderberg limestones, occur near or at the surface in the eastern and southeastern parts of the state. 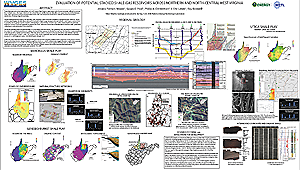 Using a digitized map of the Geology of West Virginia at 1:250,000 scale, WVGES geologists created a map showing where thick carbonate units crop out, and overlaid locations of publically-known caves as well as information from various karst-related datasets. Where available, modern WVGES maps at a scale of 1:24,000 created with funding from the National Park Service and the US Geological Survey STATEMAP program were invaluable in developing the map. While useful at its present scale, the statewide karst map can be refined further with completion of 1:24,000 scale mapping of quadrangles with karst terrain, observation of surface karst features from LidAR data, and hydrological studies. Paula J. Hunt, Gayle H. (Scott) McColloch, Jane S. McColloch, and Bascombe Mitch Blake Jr. The National Parks Service (NPS) contracted with WVGES to map bedrock geology in and around the New River Gorge National River park unit. The NPS protects over 53 miles (85 km) of the New River Gorge within the park boundary, and the map area includes ten United States Geological Survey 7½-minute topographic quadrangles. The area is known for its incredible scenery and abundant recreational opportunities, including hiking, cycling, rock climbing, hunting, fishing, and whitewater rafting. Four West Virginia State Parks (Hawks Nest, Babcock, Bluestone, Little Beaver) and the Army Corps of Engineers' Bluestone Lake and Dam are located in the map area, as is a large portion of the Boy Scouts of America's Summit Bechtel Reserve. The New River Gorge mapping project aids in defining the boundaries of paleovalleys filled with Mississippian and Pennsylvanian quartz-rich fluvial sands that became the Princeton, Pineville, Upper Raleigh, and Nuttall sandstones. The presence or absence of individual fossils or assemblages of fossils (both body fossils and ichnofossils - trace fossils) can be equally important during field mapping. The numbers and diversity of fossils are also important as an adjunct lithologic property to help differentiate and identify rock units while mapping Paleozoic siliciclastic and carbonate rocks in West Virginia. Fossil eveidence or lack thereof can be an indicator of a particular set of environmental conditions during deposition of individual stratigraphic units. For example, the shales and minor sandstones of the Devonian Brallier Formation are typically devoid of body fossils but contain a unique, easily recognizable trace fossil; similar strata of the overlying Devonian Foreknobs Formation are typically highly fossiliferous and contain a diverse and prolific assemblage of trace fossils; similar strata of overlying Devonian Hampshire Formation are typically barren except for rare plant fossils. Unusual microfossils recently recovered from the Upper Devonian Foreknobs Formation (Greenland Gap Group) of eastern West Virginia suggest that the paleoenvironmental model for the unit may need revision or refinement. Rock samples from lowermost Foreknobs containing a combination of sedimentary material suggests paleoenvironments ranging from fluvial to brackish water lagoon to back-reef marine to normal marine shelf. While the assemblage probably represents a storm deposit, it indicates sedimentary "sampling" of Foreknobs depositional environments that are not preserved or not yet exposed in this part of the Appalachians. West Virginia Earthquakes: Crustal Adjustments along The Rome Trough or Something Else? Since 1966, there have been 33 instrumentally recorded earthquakes recognized in western West Virginia within or adjacent to the structural feature known as the Rome Trough. This structure is a fault-bounded graben involving basement rocks thought to be related to failed rifting of the North American plate during the Precambrian. Interestingly, 7 of the 11 "shallow" earthquakes occurred in Braxton County, WV in a single year (2010). We speculate that the "deeper" earthquakes are associated with isolated, recurrent fault movements in response to ancient crustal stresses within and along the margins of the Rome Trough. The "shallow" earthquakes recorded in Braxton County may reflect slip related to injection activity from a saltwater disposal well that injects at a depth of 1.7 km in close proximity to a recently discovered normal fault. Also see our Reports from Cooperative Research page. Page last revised October 2018.